It would appear January 2018 is all about muff fluff for me! If you’ve already seen my previous posts then you’ll know I’m a huge fan of all things reusable. I discovered Mummy cloth just before I fell pregnant with my third son and couldn’t believe it had never occurred to me before. Feminine pads are so easy to use. They’re much nicer on my skin than disposables and much kinder to the planet, environment and much much better for my bank balance! I’ve used some Charlie Banana nappies on the boys so I’m familiar with the brand. Their ethics are amazing, they’re passionate about all things environmentally friendly and reusable. Their Instagram is also particularly beautiful if, like me, you enjoy scrolling through a feed filled with colour! My Charlie Banana feminine pads arrived in a tiny box and I was delighted how space efficient the packaging was. The box contained 4 different sized pads in a gorgeously pink print called Floralie and also a discreet wet bag in classic black. Liner pad; perfect for the beginning, end or even inbetween your periods. Regular pad; great size for a light to medium flow. Super pad; this was fab for my first day’s heavy flow. Super+ pad; an even longer pad, perfect for heavy flows and/or overnight. They’re very slim, which makes them incredibly discreet while in use. You literally cannot feel a thing while wearing them! They are super absorbent. Whilst I gave them a prewash I was genuinely astounded how much liquid they managed to hold. They are amazingly soft. 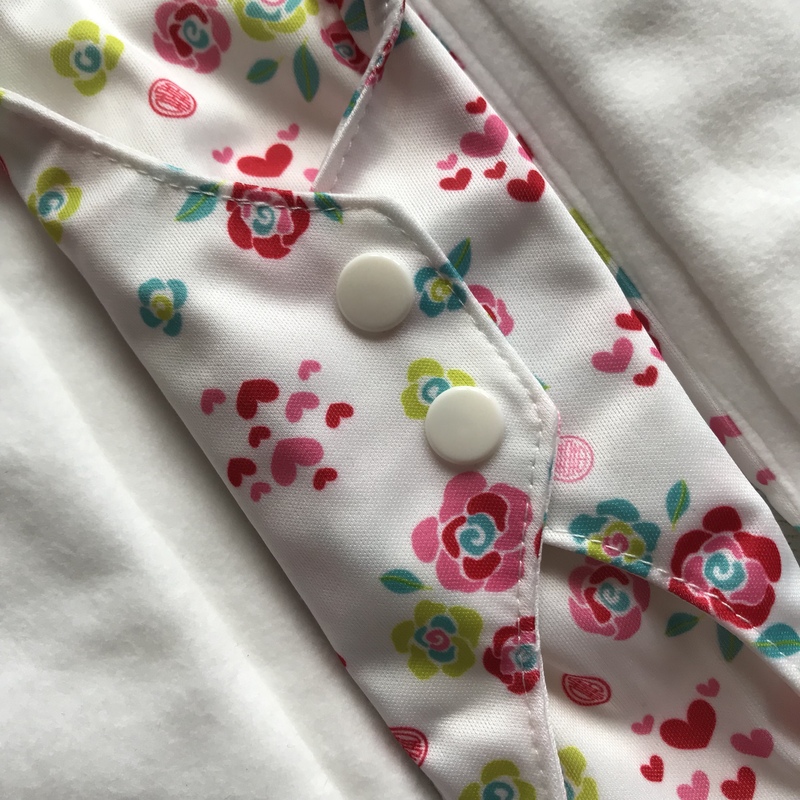 They have two popper fastenings to keep everything secure during use and also handily fold and pop back up to keep everything contained while you’re out and about! Very clever! Now that Mother Nature has allowed me to give them a thorough testing, I’m happy to report that they do the job brilliantly. The super+ pad even held up overnight, I confess I had some concerns it wouldn’t, as my flow tends to get a bit carried away while I’m asleep. I was very impressed the next morning. Charlie Banana feminine pads will definitely be used in my stash from now on. They held up during the day throughout my entire cycle with no leaks, no movement and amazingly there have been no stains! I managed to get them washed, dried and back on 3 times over the course of my period – they dried so quickly. I have a variety of wet bags in my house thanks to using cloth nappies on my boys but I don’t have many small ones at all. This combo box came with a small black wet bag and it’s a fab size. You can tuck all 4 pads in with room for more, which makes it perfect for popping in your bag when out and about. I’ve just seen that Charlie Banana has released a range of printed wet bags which are available here. I’ll definitely be looking closer at these at the end of the month. This set would be great for someone just starting out using cloth pads or even a teenager just starting their period. This pretty little box gives you everything you to get the hang of it; including a handy storage bag. There was a fab tip on the box which I want to share because it had never occurred to me. Charlie Banana recommends putting your used pads on the floor of your shower cubicle/bath while you’re in there so they can get an proper rinsing prior to washing. This is genius! If anyone is a touch squeamish about getting their hands dirty whilst rinsing a pad in the sink, this way is much easier and less wasteful as you’re already in the shower anyway! Here is the link to Charlie Banana. Their website has some great reusable alternatives from feminine pads and nappies to reusable wipes and pretty wet bags . We need more companies like Charlie Banana who have a passion for all things eco friendly and ethical. It’s so important, now more than ever, that we embrace reusables and refuse single use! It is so clever isn’t it?! I love that about these pads!